Three things have occurred simultaneously to bring joy to the hearts of the Babushki of Perovo on this Sunday morning: the sun is shining brilliantly, the fierce cold of the past months has subsided, and the paths are clean enough to walk. We emerge from our apartments to walk and sit in the sun in Perovski Park. My bones and ligaments ache from the lack of vitamin D (No, milk is not fortified here, neither is vitamin D easy to find.) and I am anxious to go and sit on a park bench, head, face, arms bare to the sun. The park is just across the street from my home, and it is in many respects, the center of my life here in Moscow. It is there that I do Tai Chi; there that I exercise at the outdoor gyms; there that I go to buy a cherry pirog (a kind of filled bun) and sit on a bench to watch the children enjoying the rides on the small outdoor carnival. It is also home to one of Moscow’s most well known football clubs: “Lockomotive.” This particular location is a training ground for young men who are looking to move up to join the professional team: a kind of minor league for “soccer.” I, being an American refer to the game as soccer of course, but in most parts of the world, and certainly in Russia, the sport is known as football. 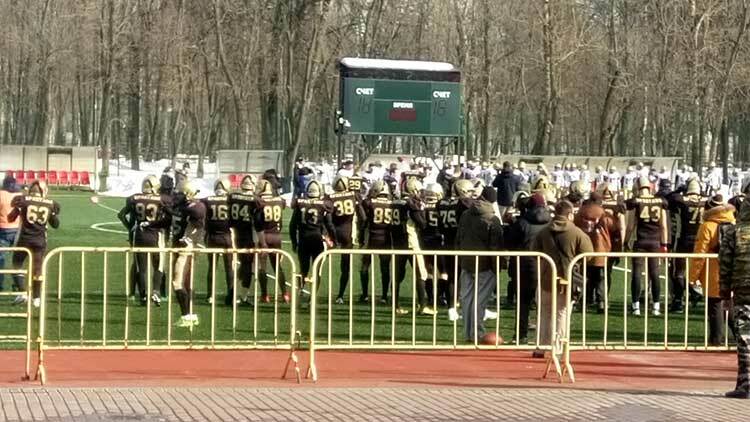 I have through the years had countless discussion with Russian friends about the differences between European “football” and American football, because truth be told, Russians don’t care about American football. I go and sit on a bench and begin a conversation with one of my fellow Babushki. Our eyes are almost exactly the same: the small and slightly slanted, thanks to the Tatar blood that we probably both share, and bright blue, thanks to our European ancestors. She tells me that she has spent the week visiting family here in Perovo, but she is on her way now to her “village”, to the winterized dacha in which she now lives. She is a teacher of English and speaks absolutely fluent English, which saves me the struggle of trying to communicate in my absolutely unfluent Russian. She asks me if I like Russia, and I tell her I love Russia. She asks me what I think of Putin, I tell her I love him as well. Satisfied and pleased with my answers, he picks herself up to walk the few blocks to the train station, and I decide to walk some more. I hear the sounds of people cheering coming from the stadium and think to myself that it really is too early, too muddy, too snowy still for a “football game” and go over to see who is playing. I cannot believe my eyes when I see players dressed in American football uniforms. Ah, I think to myself, American expats have formed teams, and I go over to look. As I get closer, I hear the Russian National Anthem being played, and when I come still closer, I see the flag of the Russian Federation. I am absolutely confused. But low and behold, it is indeed, two Russian teams facing off against one another – two traditional and well known Russian “soccer” teams – Spartak and Locomotive. They are going to play a game of American football. I stand and watch, note how perfectly their behavior has morphed from that of soccer players to that of football players. Their grunts, their jumps into the air. They do a good imitation. I cannot see well enough from the distance, but it even seems as if there are bottles of Gatorade on the table. Gatorade is not a Russian product; not popular here. I watch for a few minutes through the fence, and when I turn around, I see a small crowd has gathered; they stand there mesmerized by the game.